Last week end , the KBS (Korean boyfriend and spouse group) went to JB ! Massage , pedicures , Tesco shopping and sweeping make up removers at Watsons while in KSL mall. Also , we had tze char, bak kut teh and Korean food for dinner. One of the couples who frequented JB introduced us to this place ! It is about 3 mins away from KSL mall and cost 4ringgit to GRAB over. I didnt managed to take photo of the place and the food we had because my hp went low batt ! 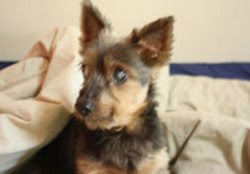 But i managed to kope some picture from google. I don’t now the source but they are just from google images. They serve like 12 side dishes ! 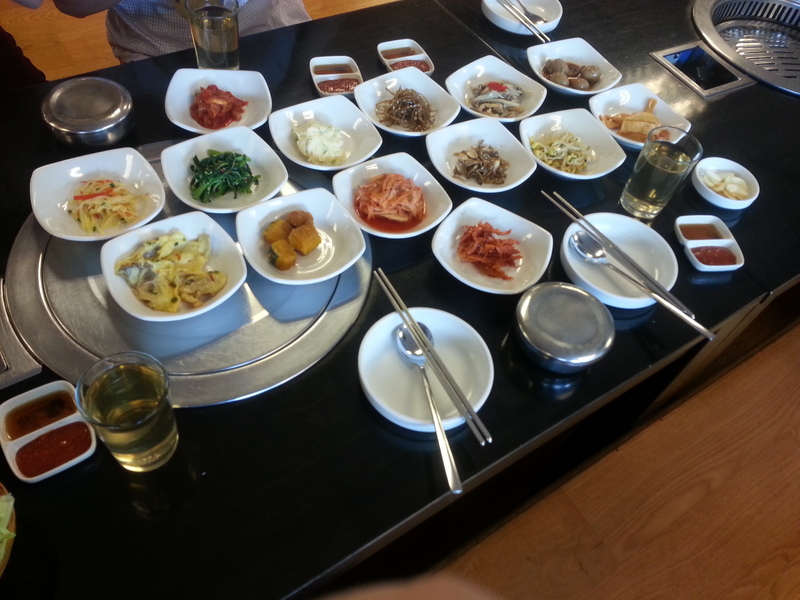 The pancake and Galbi Soup is very good ! The pancake is a MUST ORDER because it is soooo cripsy ! Especially the seafood pancake. The soup also very niceeee ! If you are planning to go JB ! MUST DROP BY THIS PLACE !!! Btw , was suprised to know that the boss is a Japanese! The pricing is affordable and good. We went to Bornga in Citysquare previously (The Citysquare in JB ! Not the one at Farrer Park hor !) . Bornga in JB is much cheaper. If you prefer to go eat BBQ , i will suggest Bornga instead of Nam Moon. 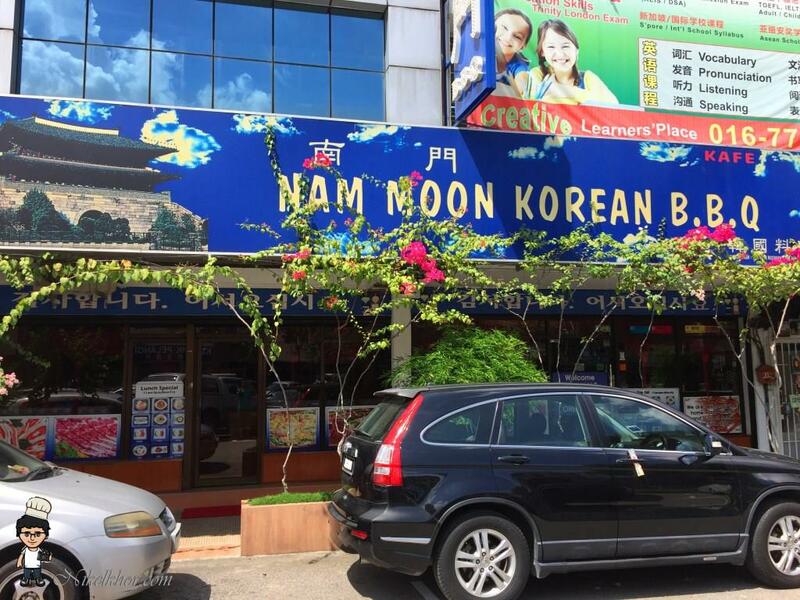 The meat quality at Nam moon is not that good. It is very thin , dry and hard like bacon. Not that shiok. But the other dishes like pancakes etc are very good there . Very home cook style. So maybe you can go there for home style Korean food and then to Bornga for the BBQ. Really enjoyed this trip ! Rented a 4 bedroom airbnb at KSL , the guys bought alot of beer , fruits and snacks from Tesco and had drinks till late night 3am. Alot of chatting and can see they are really enjoying themselves. The girls all went for beauty sleep at 1am. The guys were at one corner of the living room and the girls gathered together at another corner. Can’t wait for the next gathering and outing ! Didnt take pictures lately. I realized i missed out quite abit….during a period of time 3 yrs back when i was so insta-crazy. Everything must take photo and i didnt enjoy my food , travel and the time spent tog with hubs (that time he was still my bf). I had to bring a big bag out whenever we go out because my camera is quite big and i have to change lenses here and there. So mafan and cannot really enjoy. Now, phone aside and less photos..enjoy more…Feel so much happier ! That is why i seldom post up on instag and didn’t really blog much about the places i go and restaurants i go to…Just want to enjoy the moment and my food hehe. But of cos if i come across any good things will share lah! One of the reasons why i didnt blog much about the Korean food or restaurants i went is because….i cook at home most of the time now !!! Hehe so instead of sharing places to eat , i will share the recipes !! I have been cooking and eating at home more these days. Will share why later. Anyway , here are some dishes i cooked last week ! Very easy to cook! A friend’s hubby gave me this recipe. 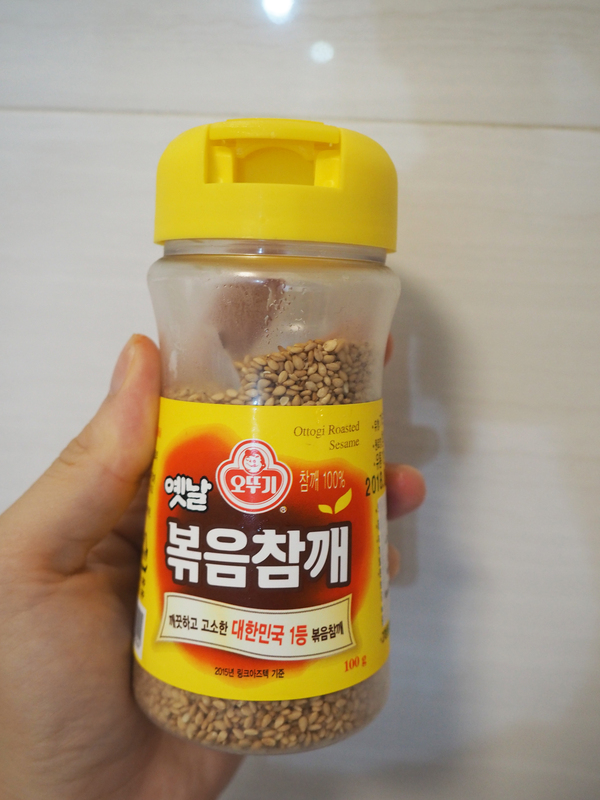 It is ALMOST the same sauce i used for most of my Korean cooking but the proportion of is slightly different. The sauce makes up the whole dish whereas the ingredients are quite easy. Raw cucumbers , boil eggs or tofu and noodles only! Mixed them up in a bowl. This serving of sauce is just nice for 2 pax. Usually i will make more and keep in a bottle and put in the fridge. Can keep for up to 2 weeks. So i can cook bibim noodle anytime by just boiling the noddles..machiam like eating instant noodle like that. But of course , healther lah. No MSG unlike instant noodles. Now it comes to the noodles ! 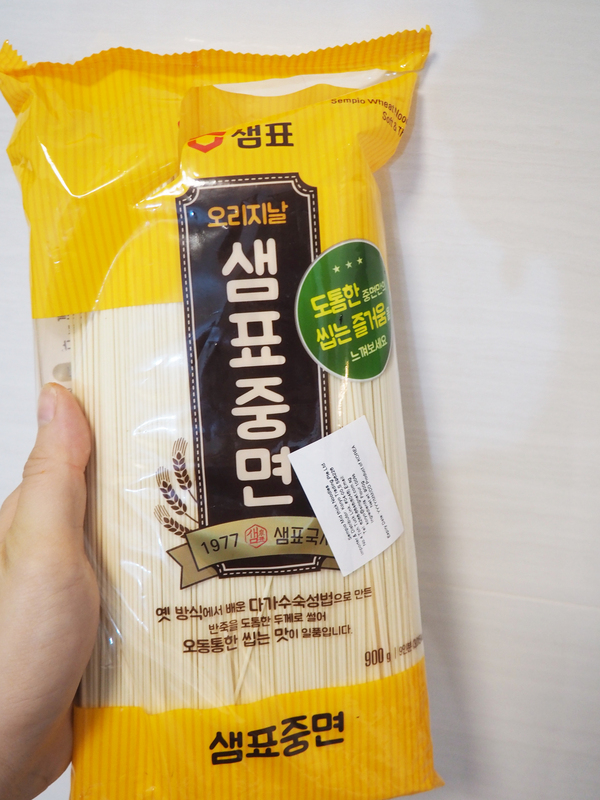 Got this from Koryo Mart for about $4.95 if i remember correctly. Can eat quite long. Don’t use the entire packet hor! That is alot..can feed more than 10 pple already. Just take out abit to boil first. If not enough , then boil somemore. I always overestimat the amount haha so i ended up with leftovers. Just like cooking pasta, boil water and put the noodles in to boil. 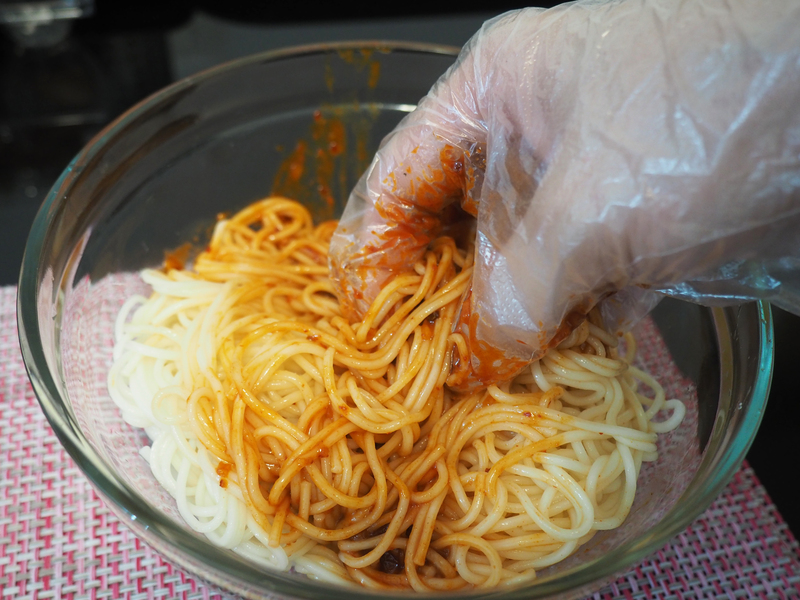 After about 4-5 mins or after the noodles are cooked , sieve it out and rinse it in cold water. Hubs is particular about tap water. So i use the electric kettle boil the water first and let it cool , pour into a plastic pail , add about 10 ice cubes. That is why it is called Cold BiBim Myeon. It has to be cold then nice mah. 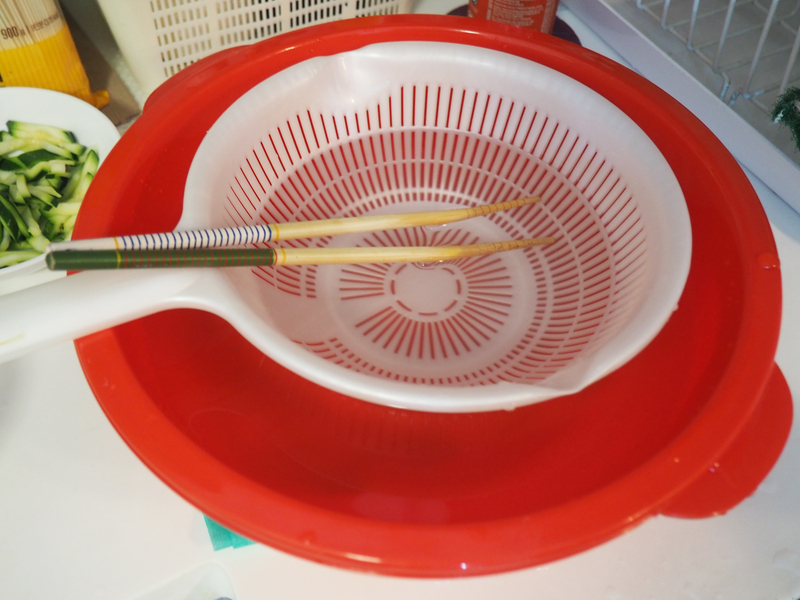 I sieve out the noodles using a siever and soak it into the pail of cold water. 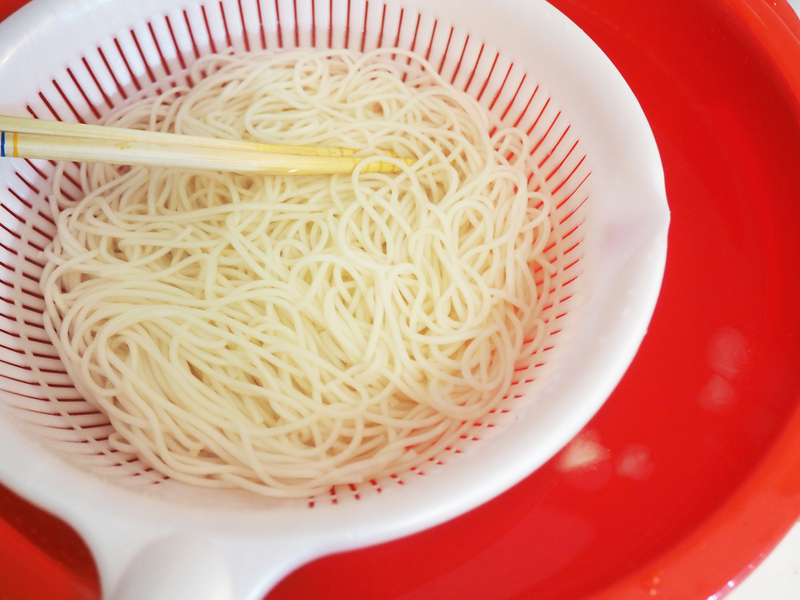 Use chopsticks to spread the noodles so they can cooled faster. After sieved out noodles and put into a mixing bowl and mix with the sauce. Of course , we won’t be eating just plan noodles. I cut the seaweed into shreads , boil eggs and tofu and sliced cucumbers into strips. 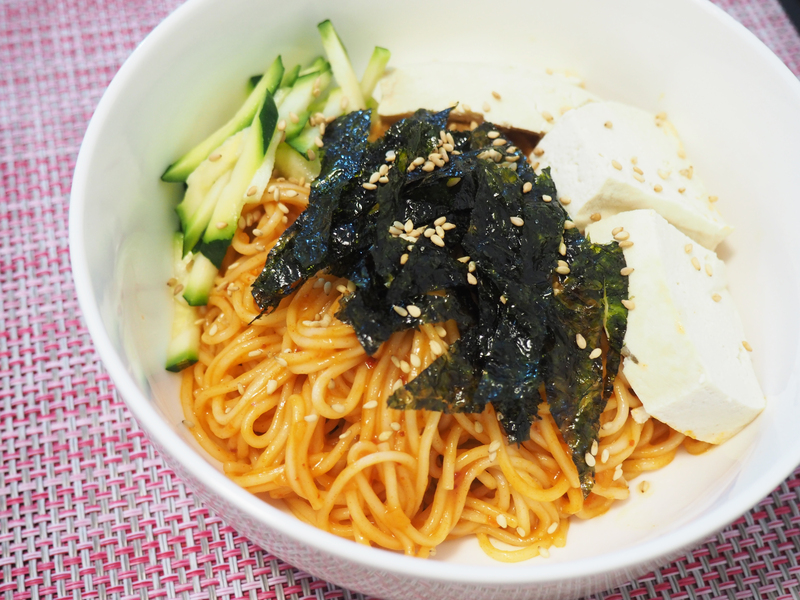 Put the well mixed noodle in a serving bowl , add in the boiled tofu and egg ( I don’t like plain boiled eggs so i didnt add in here ) , cucmber strips , shreaded seaweed and garnish with sesame seeds. Best is that you have dumplings at home. Steam them and eat together with the cold noodles. It is really shiok !! The sesame seeds brand i am using. I created a “Bibim noodle station” for my hubs. So he can make his own after work while i went out for my client appointment. Haha hubs cannot cook so i need set everything properly. He just need to boil noodles only. Very easy. 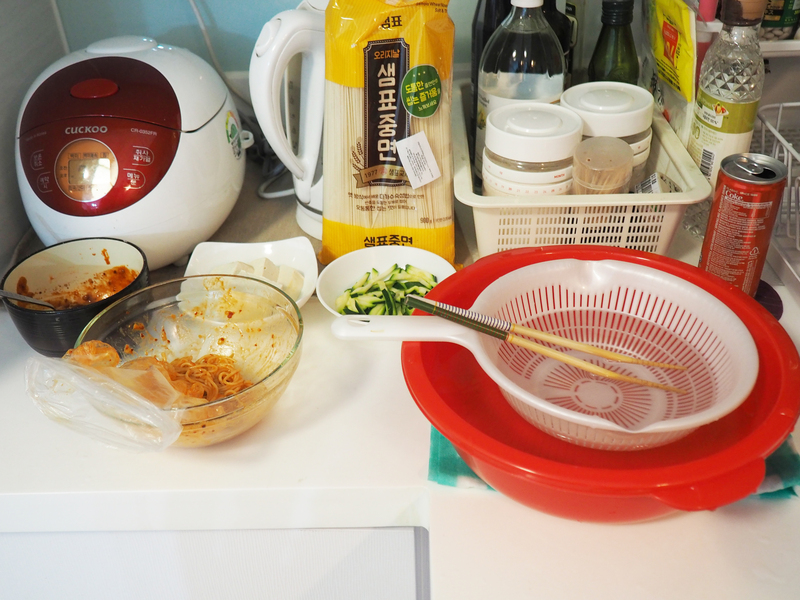 So if you are having a home party and want to make your own Bibim noodles station also can. Guests can create their own. Because some people do not like cold noodles. So they can skip the “cooling” part or just partially cool it. Some people who like me doesn’t like plain boiled eggs ( i have to eat it with dark soya sauce ! lol ) can skip the eggs and put more tofu or eat more dumplings. It is healthier than cooking instant noodles. Just boil noodles , add the pre-prepared sauce , slice some cucumbers/boil tofu/egg/dumplings and you can eat already. 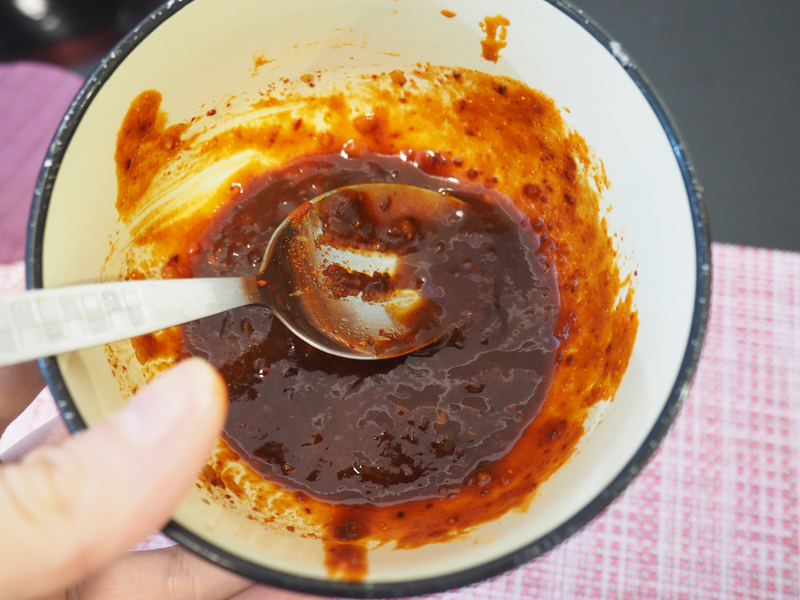 Soya suace , Gochujang (Chilli paste) , Gochu Garu (Chilli Flakes) , Korean sesame oil , White Vinegar (I always get the Korean brand ones), Corn Syrup or Rice Syrup. With all these sauces , you can basically cook anything. With $20-$25 you can get all the sauces already. Check for manufacturing and expiry dates. I realized the manufacturing and expiry dates for the Korean sauces here in SG are quite short. There was once i was in a rush and didn’t bother to check. Wah…the soya bean paste sauce was just 3 months away from expiry ! And that bottle cost $12,90 ! Very wasted if i couldn’t finish it. 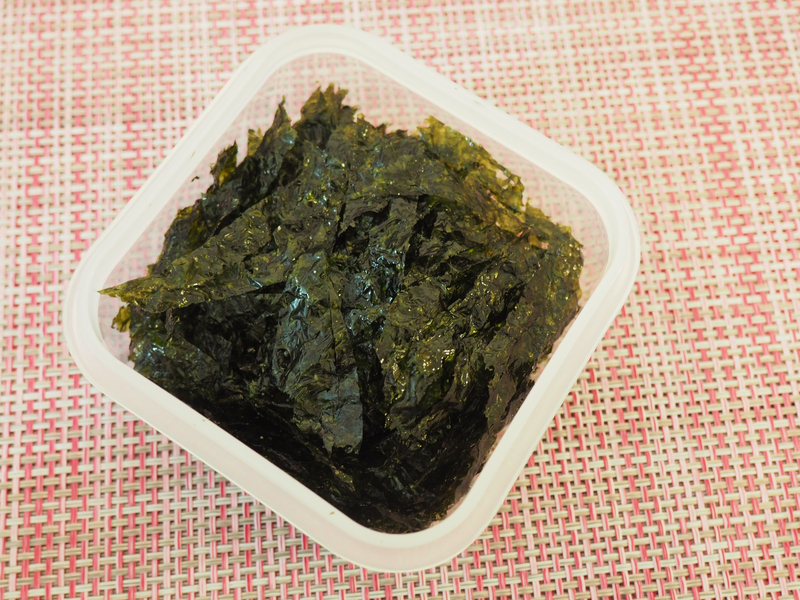 Boil water with kelps and dried anchovies. Once the water changed colour, take 0ut the kelps and anchovies and throw away Keep the soup base aside. 1 table spoon of sesame oil into the stone pot. Fry zucchini slices, potato and onion slices together with the garlic. Once the fragrant is out , add the soup base ( that was boiled with anchovies and kelps) and boil. Add 1 and a half table spoon of soya bean paste ( you can buy from Korean mart ) , add 1 tea spoon of Korean chilli paste (gochujang) and half a tea spoon of Korean chilli flakes (Gochugaru) into the stew and boil. 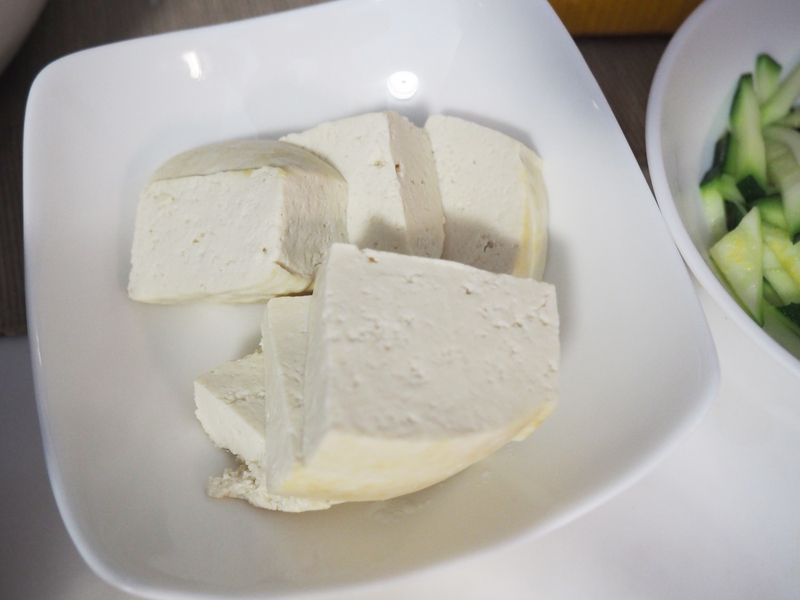 Add the sliced green chilli , silken tofu and golden straw mushroom. Leave it to boil on small fire. After about 20 minutes , it is ready to serve ! I prefer to use the stone pot. The soup tasted much nicer than using a stainless steel pot. Don’t know why also. Hope this post gives you some idea what to cook this week for your family or love ones ! Heading back to work and working on next post on #Smartlady ! It’s been 4 months since i last blogged on #Smartlady ! 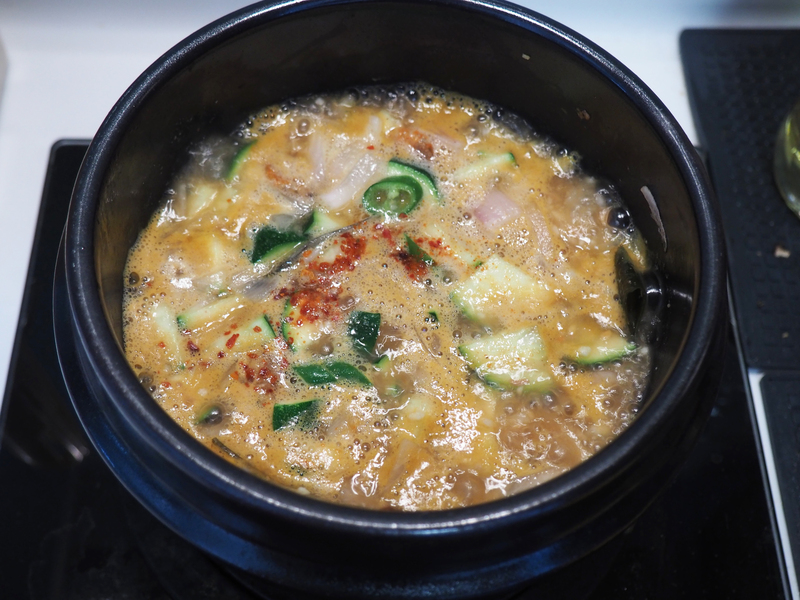 This entry was posted in Cold Bibim Noodles Recipe, Korean Food Recipe, Sgahjumma, Soya Bean Paste Stew Recipe.